As Google has grappled with newspapers firing rip-off accusations at them, one of the key responses has been from Google’s Marissa Mayer. A move to “living URLs” would drive them more traffic, she’s said, talking about it twice this past month. But such a system won’t work unless Google News fundamentally changes how it handles news content. Below, a further look, using the current news about California fires as a living example of what can and can’t be done with living URLs. The second point is hard for a journalist like me to get my head around. I don’t write for Wikipedia, which is what Mayer seems to want, Wikipedia-like stories that are constantly updated. I think I’d go insane trying to constantly edit some general story about “Google” given all they do and all that happens to them on a regular basis. Even trying to maintain a “Google Web Search” story would seem difficult. I’m still pondering the idea, however. And as I’ll explain, I’ve just experimented with it for one story, which in turn illustrates how this won’t work well with Google’s current system. That’s what might happen in the future, maybe. Let’s talk about the now, and how newspapers cannot do what she suggests, plus what they CAN to do kind of get there under the current system. By accident, I now have a system that tells me whenever there’s a fire in California. 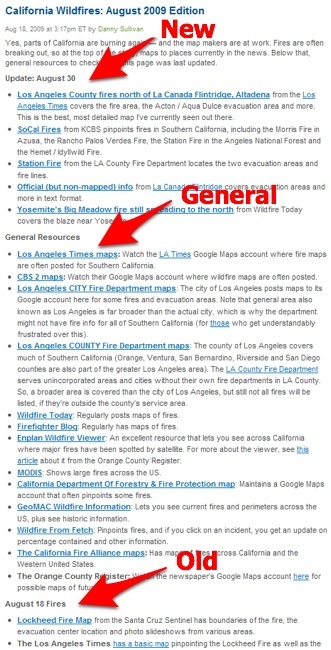 Back in October 2007, I wrote an article called Mapping The Southern California Fires that highlighted a number of maps that were published via Google Maps. The maps pinpointing the many blazes happening back then, as well as evacuation areas and other information. That article quickly ranked in Google News and generated traffic. 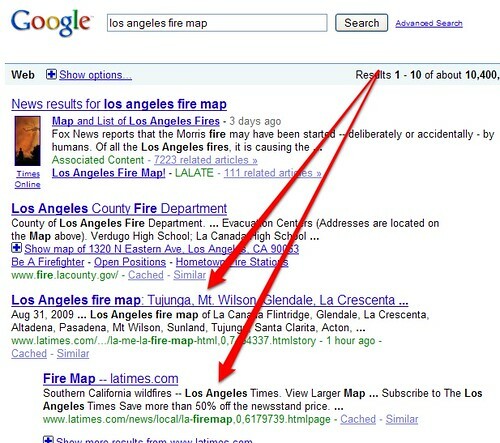 As it aged, it dropped out of Google News but still was relevant for some key fire-related terms in Google web search because of the many links it had gained. Anytime there’s a fire, there’s a spike in searches for these terms, and I see that article suddenly gain new traffic. It’s like a personal alert system for me. Now, it would be bad for the user clicking to that article if the information was still only from October 2007. But it’s not. Since that time, whenever major new fires have erupted, I’ve written a new article about current fire maps and postscripted over from the original October 2007 story. Covering fire maps isn’t the primary job of Search Engine Land, of course. There is a search aspect to this, but for me, it’s almost more of a public service role I’ve fallen into. I live in Southern California. I want to ensure my fellow residents can figure out what’s going on, as well as their friends and relatives who are concerned (often people assume all of “Los Angeles” is on fire without realizing just how big Southern California is). I know these stories will periodically pick up traffic, so I want to ensure people get to useful information if they come to them. Also, as I cover at the end, ironically I sometimes have a much better round-up than local news or government sources. As a result, each time I write a new story, I have to go back and make sure all the old stories point to the newest one, in order to best serve those reaching them. It’s a pain. If only I had a single URL that was all about California fires! The postscripting and notes like this have generally worked. I can tell from my stats that even if an older story pulls in clicks, there’s a wave of people moving to the areas I point at to get the latest news. Now yesterday, after hearing Mayer speak, I was in the airport waiting for a flight home from San Francisco when I could see fires were flaring once again. I’d just written a piece earlier in the month already covering August fires. As part of that, I included a number of general resources people could use to find information about fires in the area if new ones broke out. But I thought I’d go a step further. Rather than my category page being a “living URL” for fire news, could I do this with my August story? Yes, parts of California are burning again — and the map makers are at work. Via Google’s Lat Long blog, there’s a new comprehensive map of the Lockheed Fire in the Santa Cruz Mountains. More on that below, along with other resources to monitor as fires inevitably appear elsewhere in the Golden State. Yes, parts of California are burning again — and the map makers are at work. Fires are often breaking out, so at the top of the story, maps to places currently in the news. Below that, general resources to check since this page was last updated. I felt pretty good about this. Even if new fires broke out (and they already have since I did the update), I knew that the general or “evergreen” resources would help people get to good sources of information. If I were to use Mayer’s “living URL” model, this page would be the only one I have about Southern California fires. Because I’d keep updating it on the same URL, despite the changed content, Google News would still consider it old. It simply could not compete against fresh content on Google News. In addition, it wouldn’t compete against very specific terms. Right now, one of the biggest blazes is the Station Fire. That fire name didn’t exist until a few days ago. It’s a popular term people searching for. To rank, you really want to help yourself by including those words in the article’s HTML title tag (which typically reflects the article’s headline). But if you change the headline, potentially you don’t continue ranking for other terms in Google News. More important, changing the headline won’t help since Google News probably won’t come back to see your new headline anyway. Of course, I could have a new “living” article all about the Station Fire, which would include maps. As part of that article, I could link to my “living” article about wildfire maps in general. Then I could also hope people see the links and get to what they wanted. I could do the same for all other files. When I’m done, then I’d be Wikipedia. Or not, because two weeks after I put my August 2009 story up, they finally produced their own “August 2009 California Wildfires” page that doesn’t link to any master page. Mahalo lacks interlinking, also. Still, the living URL idea makes sense — it’s just not really that different from what savvy search engine optimization people already do. You have a page for each topic you hope to rank for, full of good content. For news sites, these topic pages are often links to all their past stories. If you want to get fancy, you can add some evergreen/general content to the top of those pages. Our keyword research category page is an example of this. For me, if I were really into covering California fire maps, I’d make a special category called “California Fire Maps” or whatever seemed to be the most commonly used term. I’d move some of my general content into that area, then have my individual stories follow. I’m not THAT much into it, though I might do it in the future, because as I said, it’s sort of a side area I’ve stumbled into serving here. Of course, the real place that should do it for these types of topics are the newspapers — the same audience that Mayer is aiming her suggestions to. Over there, it’s a nightmare. I want to scream, because I’ve messaged the LA Times in the past about this, and I’ve even spoken on the topic (see Quick Tips For Newspapers & SEO). They have old content that ranks for fire-related terms that doesn’t point over to the new stuff. Search for southern california wildfires, and you also get that map coming up on its own. It’s a terrible experience. No date, and places are pinpointed that aren’t currently burning. 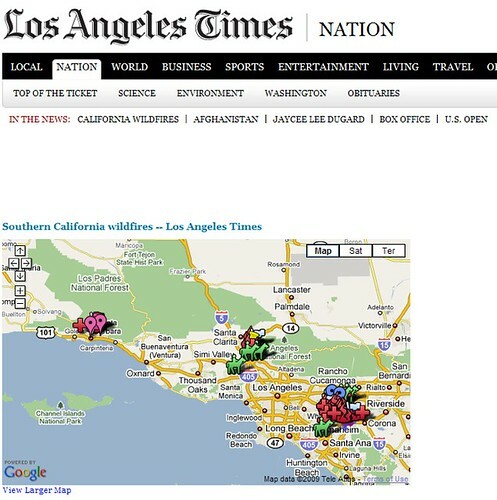 So why’s the LA Times not ranking for california wildfires? It’s hard to say. I know in the past, the Times wasn’t doing a good job having these types of pages. When I spoke, this was one of the things I talked about. I was also frustrated that last November, I couldn’t find a list of all its current election endorsements. I kept getting to a page of old ones. If I search for “la times election endorsements” today, I end up at a page of last Novembers endorsements, not any from the most recent elections in California. Going to the home page of the editorial section is no help, either. So maybe this topic page is relatively new and still needs time to earn a reputation with Google. The HTML title tag currently reads “L.A. 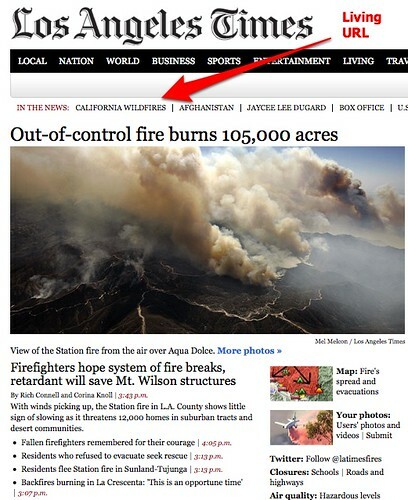 Now | Wildfires | Los Angeles Times.” Since the page already ranks for “wildfires” on Google, adding the word “California” to wildfires might make the difference. Perhaps 112 external links to the page just aren’t enough. The LA Times is pushing the living URL page on its Twitter account — perhaps that might help down the line. As you can see, topic pages aren’t guaranteed to be sure hits for newspapers. Even if they were, there’s another concern that it’s probably not in the user’s interest that we end up with five Wikipediapapers that dominate all the top results on Google in the way Wikipedia already does. But certainly it’s something for newspapers or any news sites to consider. It’s something everyone can do better out, including us here at Search Engine Land. It’s all too easy to get lost in the reporting of the current story and not think about what happens to that story once you’re done. Let’s also not forget that Google could do with a little advice of its own. Having done so many searches for fire information over time now on Google, I repeatedly see it leaving stories up in the top results that are no longer relevant. 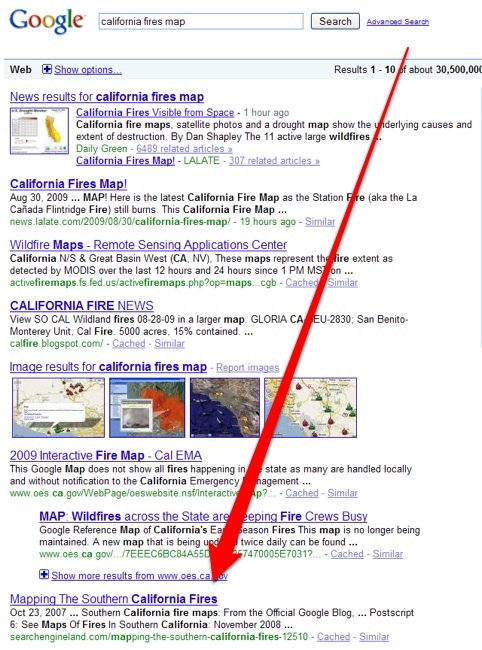 For california fire map, it points in the top results to this map from California’s state fire agency — a map from 2008. That’s bad relevancy on the part of Google. Meanwhile, those who want to find user-generated maps of fires on Google maps still face some of the frustrations I covered in my San Francisco Oil Spill Maps & Wishing For Better Community Map Search Tools article of 2007. Yes, at least now I can search just for user-generated content, using a drop-down box added in 2008. But without a sort-by-date option, that’s kind of useless to find the latest maps. Adding to the mess are the junky blog posts on fire-related terms that get into Google Blog Search, even with the default “sort-by-relevancy” enabled. In covering this, I also have frustrations with the various cities and fire agencies. People want maps. I can see this, because they’re arriving at my site. But the agencies themselves sometimes seem lacking. For example, in my update yesterday, I was having to explain why the city of Los Angeles’s fire department had no news of some fires. This is because the city only covers a small part of Southern California. But many people don’t know this. I was pleased today to see that the LAFD seems to have added some language about this on its blog. Still, why isn’t there a better master map for the entire state to use. Can’t the cities interlink more with each other? And La Canada Flintridge, I know your city is facing this terrible disaster, but you had no map of the evacuation areas on your web site yesterday. Just textual guidance in PDF format! Not to mention updates that, because you use frames, can’t be bookmarked for other people to share (unless you know how to get the URL, which I do — here). At least you link to the LA Times map today. Overall, the “living URL” idea sounds compelling at first glance. But for newspapers to give up individual articles in favor of one “master” piece per topic that’s constantly updated, Google would first have to make some fundamental changes. In the meantime, there’s much that can be done to ensure you have both “topic” pages that serve to consolidate readers looking for content in general as well as individual articles that serve particular breaking stories. Ideally, these both work together.